﻿ Q257: How can I integrate Planyo with my booking.com extranet? FAQ Q257: How can I integrate Planyo with my booking.com extranet? If you have an account with your properties at Booking.com and you want to integrate it with Planyo, you can use our Booking.com XML Integration extension. Depending on the integration type that you choose, the extension can synchronize the availability and rates between Planyo and Booking.com. Availability of rooms in Booking.com will be imported from the associated Planyo resources (see Potential issues below). On the other hand, all reservations made in Booking.com by your customers will be exported with complete data to Planyo and will get a Planyo reservation ID. This way, you can have access to all reservations in one place, whether they were made in Booking.com or in Planyo. This also allows you to have only a part of your rooms assigned to Booking.com while the rest is available to your customers only through your web site. First of all, you need to turn on Planyo as a Property Management System (PMS) for your property. Log in to your Booking.com Partner Central and choose Property / General Info from the menu on the top of the page. Under Which property management system are you using? unselect the I don't currently use a property management system option. Next, start typing 'planyo' in the search field and select the value in the drop-down list when it becomes visible. Click Update your info. Next, choose the preferred connection type that you want to use. You can choose to fully integrate with Planyo, so both availability and prices are uploaded to Booking.com as well as reservations are imported into Planyo. You can also choose a one way connection, so either Planyo only uploads availability and prices for your hotel rooms or only imports reservations made in Booking.com. In the next step, Booking.com will ask you to accept the XML Service agreement. After you do so, Planyo will be notified by Booking.com about the initiated integration and asked for confirmation. When this is completed, you can finally activate the XML connection on your extranet. Next, you need to turn on the Booking.com XML Integration in Planyo. Once logged in to your Planyo account, go to the Booking.com extension page in Planyo Store and click Buy as subscription. Next, click Go to the setup script to configure the integration. First of all, you need to specify your Booking.com hotel ID so Planyo can access your property. You should also select the same connection type as you previously did in Booking.com. Once this is done, the extension will download the list of your hotel rooms and rates. Now, you need to do a matching between your Booking.com hotel rooms corresponding Planyo resources. In order for the extension to work, you need to have existing rooms (resources) in your Planyo account that will correspond to your Booking.com rooms. According to the connection type that you selected, the extension will synchronize the availability and rates between planyo and Booking.com. Availability of rooms in Booking.com will be imported from the associated Planyo rooms. On the other hand, all reservations made in Booking.com by your customers will be exported with complete data to Planyo and will get a planyo reservation ID. You can add Planyo rooms in your Planyo account. Make sure the planyo resources are well set-up and note that their quantity will be the quantity available to booking.com customers (you can use the Max availability limits feature to easily change the number of rooms available in Booking.com; you will learn more about this later in the tutorial). The planyo resources should also have the max. number of persons specified for each room. Once finished, click Continue to accept the settings. Note: if you have chosen the Only reservations (one way) connection type, you can skip this section since you don't need to set up any prices or upload availability. Now, you need to initially upload availability and prices for your hotel rooms. Booking.com requires that you have availability for next 12 months uploaded for your property. You can start the initial upload by clicking Upload availability on the setup page. Still, before you do this step you should set up prices and choose the maximum number of rooms that you want to be available to Booking.com. In order to set the availability limits, click Prices and restrictions. At the top of the page, you can switch between your Booking.com rooms to change their settings. By specifying a maximum availability limit, you can limit the room's availability in Booking.com for chosen days, compared to the total quantity set in Planyo. The Max number of rooms available in Booking.com (default) value applies to all reservation dates. Additionally, you can also modify the value up or down for individual days. If you don't specify any limits, either default or on specific days, the availability will simply depend on the resource's availability in Planyo. For example, let's say the quantity defined for a room in Planyo is 25 but you want to give to Booking.com only 10 of the rooms. This way, customers reserving on Booking.com will be able to take only 10 rooms while the rest can be reserved from your web site. In this case, you need to set the Max number of rooms available in Booking.com (default) value for the room to 10. Click Default limit in the Max Availability Limits section, type 10 as the default limit and click Update. This way, availability uploaded to Booking.com for the room will never be higher then 10. Let's say that you additionally want to increase the maximum availability for the room for dates between 20th and 31st December to 15. Simply click the link for December in the Max Availability Limits section, select 15 from the drop-down list for the days and click Update. Note that the values define the maximum availability that will be uploaded to Booking.com. If you limit the availability of the corresponding resource in Planyo, e.g. by adding vacations, the number of rooms available to Booking.com can be even smaller. The same way, you should setup the limits also for other rooms if necessary. Note that you can switch between the rooms by using the drop-down list at the top of the Prices and restrictions page. Note: the currency of your Planyo site should be the same as the currency set in your Booking.com hotel settings. Before customers can reserve your hotel rooms, you also need to setup the prices. Usually, for each room you have a few rates that you can use, like Standard rate, Special rate or Non Refundable rate. In order for the room to be bookable, you need to specify price for at least one of the rates. If the room can be reserved for more then 1 person, you can specify a different price for single use (when only 1 person stays in the room) or price per night (for more than 1 person). In order to choose prices, click Edit next to the Rate prices section. Once on the page, in the Standard price row you can enter prices that will be valid for all reservation dates. If you don't want to make some rate available for the room, simply don't enter any value in the column. For example, if you specify for Standard rate 120 for single use and 150 for per night, customers will be able to reserve the room only with the standard rate. If you additionally specify prices for Non Refundable rate, the room can be reserved for this rate as well. Beyond the Standard price, you can also specify prices for selected periods of a year. For example, you may want to setup a higher price for days between December 24th and 31st. In order to do this, you need to add a new season for these dates in the corresponding resource in your Planyo account. Once logged in to Planyo, choose Settings > Seasonal settings from the main menu. Then, from the drop-down list at the top choose the resource corresponding to your Booking.com room. Next, in the Enter new season section choose December 24th as the from date, December 31st as the to date and click Add. Now, go back to Edit prices in the extension and refresh the page. A new period for the selected dates appears below the Standard price. Again, you can choose different prices for the period for each rate. Note that this way you can allow certain rates to be available only in given period of time. For example, if you don't specify any price for Special rate in the Standard price row but you enter a price for this rate for the dates between December 24th and December 31st, the rate will be available to customers only in this period. Again, in the same way you should also define prices for other rooms of your hotel. You can have prices for Standard rate automatically imported from your Planyo Pricing Manager and uploaded to Booking.com. This way, instead of entering the prices for Standard rate in the extension, the prices will be automatically taken from your Planyo settings. Please note that prices for other rates, like Special rate, Non Refundable rate etc. need to specified in the extension anyway. You can turn on automatic price synchronization for Standard rate on the Prices and restrictions page. By clicking [Preview the prices for 'Standard Rate'], you can preview the current prices as they are defined in Pricing Manager. These are the prices that will be uploaded for the room to Booking.com. Please note that Booking.com supports only simple daily pricing for Single use and Per night usage of a room. On the other hand, Planyo Pricing Manager allows to enter rules and conditions that cover most advanced pricing configuration, including reservation form field rules, time remaining until rental etc. Not all of the rule can be easily translated to a flat pricing supported by Booking.com. For this reason, we use simplified daily pricing extracted from your pricing rules. Because of this, some of the advanced rules added in Pricing Manager may not be reflected in the imported price values. Before turning on the automatic price synchronization, you should open the preview of the prices and check that you actually want to use the values in Booking.com. When later on you modify your Pricing Rules in Planyo, any modified values will be automatically uploaded to Booking.com. Please note that the update can take up to one hour. If you need to refresh the prices in Booking.com quicker, you can always do this on the Manual data update page. Note: if you have chosen the Only reservations (one way) connection type, you can skip this section since you don't need to upload any availability. Now that availability limits and prices of your hotel rooms are defined, you can upload the data to Booking.com. Go back to the Setup page and click [Upload availability]. Once the update is finished, you can go to your Booking.com Extranet and check that everything is uploaded correctly. Note that this initial data upload needs to be done only once. From now on, all changes to prices and availability will be updated on your Booking.com account automatically (see Potential issues below). Note: if you have chosen the Only reservations (one way) connection type, you can skip this section. If you want to change prices for one of your rooms, modify its availability or set up restrictions, you can always do this on the Prices and restrictions page. Once you submit the changes, the extension will automatically update the data on your Booking.com account. Note that availability, prices and restrictions can be also modified as the result of changes made on your Planyo account. In such case, the related data will be automatically updated on your Booking.com account as well (see the note below). For example, if you modify in Planyo a vacation of a resource assigned to one of your hotel rooms, the corresponding Booking.com room's availability will be updated as well. Similarly, when you change or remove a season, this will also update the room's prices and restrictions if necessary. Note: modifications of vacations made through Planyo API (if you use one) will not cause automatic update of availability. In such case, you may need to update availability manually by choosing Manual data update on the setup page. Note: if you have chosen the Only rates and availability connection type, you can skip this section since you get details about reservations directly from Booking.com via fax or email. When a reservation is made by a customer on Booking.com, it will be automatically imported into Planyo and visible among other reservations in your Planyo administration panel. On the reservation's details page, you can view all information related to Booking.com. This includes the due commission, guest name, smoking preferences as entered by the customer, their notes and special requests about the visit and all other details. Note that though the Planyo view allows making modifications to the reservation, this shouldn't be used for Booking.com reservations. Whenever a customer is making a reservation at Booking.com, they are sent a link where they can change the reservation's details. This includes changing arrival and departure dates, modifying number of persons or even rates. The changes will be automatically updated and visible in Planyo. Any modifications to the reservation made in the Planyo administrative panel will not be reflected in any way in Booking.com. For example, if you cancel the reservation in Planyo, it will be still visible as valid in Booking.com and all due commissions and fees will have to be paid to Booking.com anyway. You can always visit your Booking.com Extranet to verify that the data uploaded for your hotel rooms is correct. 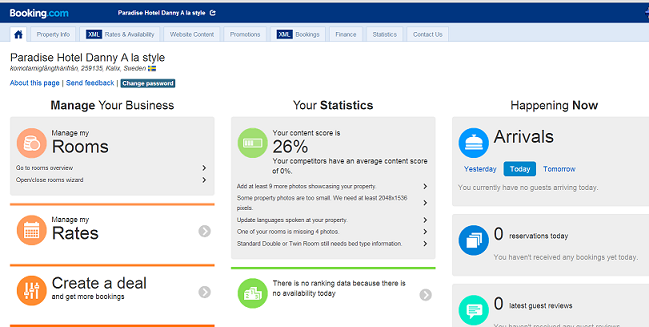 You can also check there content, update your commission and view statistics for your property. There are some issues that you should be aware of when running synchronization between Booking.com and Planyo. If you have assigned an allotment contract (or a so called 'minimum contracted rooms') with Booking.com, you should be aware that the quantity of rooms included in the agreement should be soled only through Booking.com. Our extension is not able to set the availability for such rooms below the contracted allotment (of course unless a reservation was made through Booking.com). In such case, Booking.com will change the availability accordingly with the contracted quantity that you assigned with them. This in some cases can lead to overbooking. This means that you should offer through Planyo only this number of rooms, that is not contracted with Booking.com. For example, if you have 5 Double rooms set up in Planyo and you have contracted 2 of them with Booking.com, you should offer through your Planyo web site only 3 such rooms. You can set it up by using packages. You can create a package containing the Double room, give it the quantity of 3 and offer it through Planyo. This way, your customers will be able to book all 5 rooms through Booking.com but only up to 3 through your Planyo site. As mentioned, the extension will synchronize the availability between Planyo and Booking.com. When there is a new reservation added in Planyo or when you enter a new vacation, the availability will be automatically updated in Booking.com. On the other hand, if you change any configuration options in Planyo that could affect quantity of a given resource, please update availability of the assigned Booking.com room manually. You can do this on the [Manual data update] page in the extension. The configuration options that could affect quantity of a resource can be the quantity value itself but also e.g. package options (when using packages). In Planyo, you can define unit names for a resource whose quantity is greater than one. See FAQ136 for more info about this. On the 'Unit Names' page, you can use the 'Unit assignment for customer reservations' option to choose how the assignment will actually be done for your reservations. If you choose that a unit name must be assigned to a reservation when it is being added, this may cause that a reservation coming from Booking.com is not properly imported into Planyo. This can happen when the reservation dates are actually free, but no single unit is available for the entire rental time. For example, let's say that you have a resource with the quantity of two and two unit names: yellow and blue. Let's say that on 21th and 22nd availability for the resource is 1. Still, on 21th this is yellow that is free and 22nd this is blue. When pushing data to Booking.com, availability is a flat value there and for both 21th and 22nd it will be simply one for this room. Now, when a client reserves 21th to 23rd at Booking.com, the reservations will be allowed as the room is free. On the other hand, when the reservation is being imported into Planyo there is no single unit that is actually free for both 21th and 22nd. If the 'Unit assignment for customer reservations' option tells that a unit must be assigned, then the reservation will not be imported. In such case, a vacation will be added for the two days to block the period and prevent any overbooking. On the other hand, if the option's value doesn't require any assignment, the reservation will be added successfully. Sometimes you can receive from Booking.com a message to your email or fax saying that the IT Provider (Planyo.com in this case) didn't automatically pick up information about a booking. When a reservation is made by a customer in Booking.com, it will be automatically imported into Planyo and visible among other reservations in your Planyo administration panel. On the other hand, it can sometimes happen that we are not able to receive info about a new or modified booking from Booking.com and will not be able to import it into Planyo. In such case, the reserved period will not be blocked and will still appear as available for other bookings. This can result in an overbooking when another person reserves the same room and days. In such case (when the IT Provider hasn't automatically imported a booking) the mentioned message is sent to your email or fax. In return, you need to make a manual action in Planyo to actually block the booked period and prevent a possible overbooking. You can do this by adding this booking in your Planyo admin panel manually. You can find full booking data (the arrival and departure dates as well as the customer details) in your Booking.com extranet. Simply searching for the booking ID sent to your email or fax. This way, the newly created booking will block the reserved days and prevent other customer from reserving them again. Additionally, you should also connect the newly created Planyo reservation to the original booking in Booking.com. You can do this directly in our Booking.com Integration Extension by clicking Booking ID assignment at the bottom of the page. This way any updates coming from Booking.com will be pushed to correct Planyo reservation.